Chickens roam. Out in the pasture, donkeys bray. Cows graze. Two enormous Great Pyrenees patrol the property for intruders. A cabin built in the 1800s sits atop the hill overlooking the vineyard. Folks in jeans and t-shirts casually lounge in rockers on a front porch. An unlikely setting for a winery. 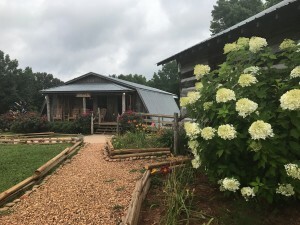 However, its unique setting, collection of farm animals, and laid back atmosphere are exactly what make Cavender Creek Vineyards memorable. At many wineries, drinkers feel insulted from wine’s agrarian roots. Sitting atop bar stools in an air-conditioned room, cool and comfortable, you might catch a glimpse of the vineyards but doubtful is it that you consider that the product your imbibing comes from the soil of the earth and the toil of men and women. Seeds were sown. Plants were cultivated. Weeds were subdued. Soil was amended. Wine is hard work! At Cavender Creek, you’re very much aware of this fact. You’re on the farm and the folks at Cavender want you to feel that. Consequently, a donkey is the official mascot of the vineyard. Specifically, Donkey Hotie is the official mascot of the vineyard. Hotie can be seen on their labels, t-shirts, and business cards. Another mascot, albeit unofficially, is Tinkerbell. 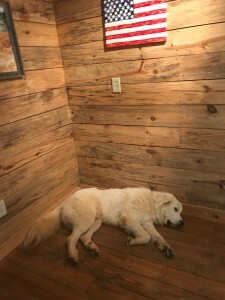 Ironically named after the tiny fairy from Peter Pan, Tinkerbell is a massive and majestic Great Pyrenees that serves as a watchdog on the property along with her counterpart Tucker. Tucker and Tink are gentle giants, at least to people, but serve to keep coyotes, bears, or any other predators and pests at bay. For more information about the animal, and human, “staff” over at Cavender Creek, head on over to their website. In addition to their unique atmosphere, Cavender’s events also draw a lot of folks with their events. They consistently have great live music—every weekend and sometimes during the week. They also host art shows featuring the work of local artists like Grant Searcey, among others. Cavender has recently entered the private event market as well, hosting events like weddings, rehearsals, parties, fundraisers etc. in their beautiful event barn overlooking the vineyard. Also notable is the fact that Cavender Creek is kid-friendly. If you’ve ever been in a winery with a child, you probably found yourself prying little fingers from breakable merchandise and making sure he or she doesn’t bother the other patrons. That’s not the case here. Children will be thoroughly entertained looking out over the pasture at sheep, cattle, running around in the grassy field beside the tasting room, or throwing the frisbee for one of the dogs that freely roam the property. Not only so, but the winery is going to be installing a playground. Cavender Creek is a great, laid-back place to come enjoy wine, good company, and beautiful scenery. Definitely a favorite amongst North Georgia Wineries. Pay them a visit just down Cavender Creek road just a few minutes from the Dahlonega square. Also, they do have a tasting room at Canvas and Cork in downtown Dahlonega, so don’t forget to stop by there as well! Don’t forget! Long Mountain Lodge offers Winery Tours to our guests, featuring commercial transportation to and from the Lodge, lunch at a winery, and tastings at three of our local wineries. So, give us a call or book your stay at the Lodge online today.